Fr. Matt Fase, CSC, was born and raised in Rockford, Michigan. 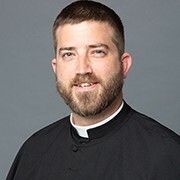 He attended the University of Notre Dame for both his undergraduate and master’s degrees, graduating in 2010 with a BA in Theology and in 2014 with a Master of Divinity. He joined the Congregation of Holy Cross in 2006 as a freshman in the Old College Undergraduate Seminary Program. In 2010 he entered the Holy Cross Novitiate in Colorado Springs, Colorado and professed first vows in July 2011. Matt professed his perpetual vows and was ordained a Deacon in September 2014. On April 11, 2015, along with his five classmates, he was ordained a priest. Fr. Matt’s first assignment was to Holy Redeemer Parish in Portland, Oregon. There he served as a transitional Deacon and associate pastor. He worked in Sacramental preparation for all stages and ages. At the parish Pre-K through 8th grade school, Fr. Matt served most notably as the “Lunchroom Monitor”. Fr. Matt was reassigned to Stonehill College in July of 2017, where he currently serves as Campus Minister for Faith Formation and Athletic Chaplain. He coordinates many Campus Ministry retreats, such as Christ Encounters, First Year Students Retreat, and Senior Retreat. Along with recording artist Amanda Vernon, Fr. Matt co-authored the memoir, When God Wrecks Your Romance: Orthodox Faith, Unorthodox Story. For more information about the book or to request Fr. Matt as a speaker for your event, visit whengodwrecksyourromance.com.